DENVER (AP) Michael Malone wasn’t all that thrilled about the lack of composure in the final quarter. Or all the turnovers. Or the shot selection. Or even the defense. Still, he won’t quibble with the outcome. ”We survived,” Denver’s coach said. ”I don’t know. I’ll have to go back and watch film to figure it out,” said Smith, who finished with 25 points. ”I thought we looked like a poorly coached team in that fourth quarter,” Malone said. ”I take that very personally. We all have to be better down the stretch. If that game is 10 seconds longer, we probably lose. Trying to address the issue of slow starts, Malone tweaked the starting lineup by inserting Barton and sending Mason Plumlee to the bench. The change worked as Denver led at halftime. That’s significant because it halted a streak of seven straight games in which the Nuggets trailed at intermission. Denver made protecting the paint a point of emphasis in this contest. When the Mavericks beat the Nuggets 122-105 on Dec. 4, they dominated points in the paint with 64. That figure comes with a caveat – Jokic was sidelined with an ankle sprain. Harris and Jokic combined to score Denver’s opening 22 points, before Plumlee got in the scoring act with a free throw late in the first quarter. Mavericks: J.J. Barea sat out with a strained groin. 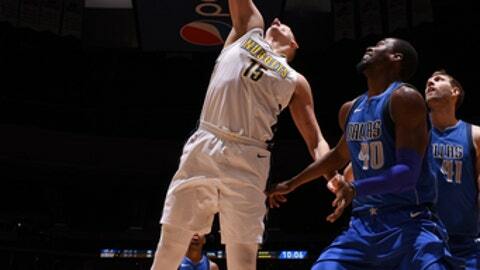 … F Harrison Barnes contributed 17 points, while reserve Devin Harris had 16. Nuggets: The team had two buzzer-beaters – Barton on a 3-pointer to end the first quarter and Jokic with a tip-in to close out the second. … Jokic had seven assists. Carlisle said it’s looking like at least February until Dorian Finney-Smith (left knee), Nerlens Noel (left thumb) and Seth Curry (left tibia) return. A reason for Denver’s disparity between its home record (16-5) and road mark (7-16) is plain, old youth. Malone isn’t worried about Jokic’s up-and-down performances. All part of his learning curve.